G3 Wake/surf rack for upper placement? Where can I get the angled fixed racks for the G3 upper placement. I just got my LSV and had dealer put both swivel racks on port side so I can put my sky sky on driver side. Problem is my board and bindings rub. I saw a post about upper racks being angled. where can i get those? Samson racks are top notch and less than $900 plus you have fork and angle options. Bakes has them. so no cheap fixed options? Or can I mount to the round bar? Guy here has a couple for sale at a reasonable price - they are spinners also. Not sure about the whole upper vs lower thing. The racks on mine were on the uppers when I bought it. How much angle difference is there in the forks for top vs bottom? Question for you - how did they put both racks on the one side if it hadn't been ordered that way? There is a right/left marked on the racks and I don't think that you would get it to fit/work correctly on the wrong side. I told them I had a sky ski going on driver side and they just swapped my rack for another port side. If I could adjust the angle they would be fine, just too flat right now. I told them I had a sky ski going on driver side and they just swapped my rack for another port side. Why not just ask the dealer to swap you for the correct upper then - assuming there is a difference in the forks and they gave you the wrong one? I will check, I just havent seen any boats there with the upper racks. What about the round bar can I mount to that? When I purchased my '11 LSV, I ordered both sets of racks. I received two sets of "lower" racks. This past winter when I was making a statement to my dealer, they researched and asked/ordered the upper. When the uppers arrived, they were a set of lowers. After additional research and speaking with Malibu, they no longer sell spinner upper racks because when spinning in, they would hit the bimini (if installed). They only sell the angled fixed racks. 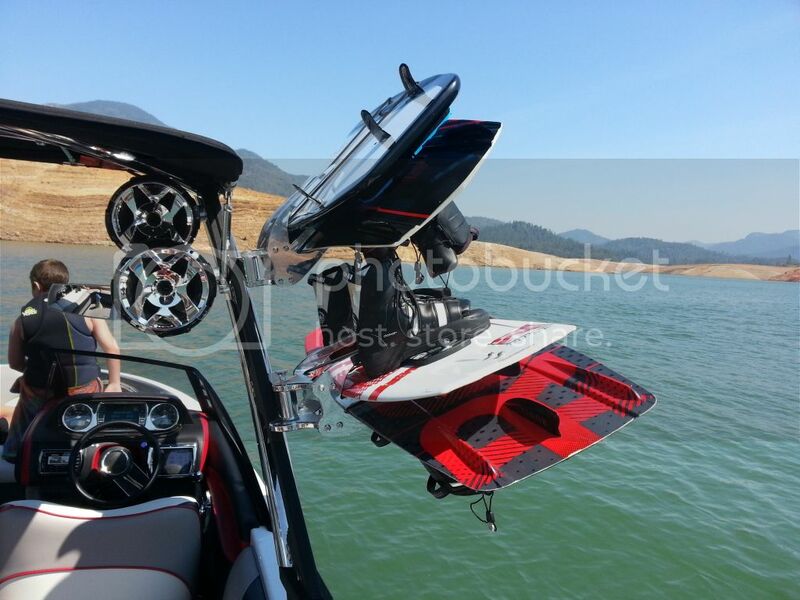 To your point, the angle of two racks on one side is virtually impossible to fit 4 wakeboards - unless two are hyperlite system boards. Here's a pic with the lower spinner + the upper fixed rack. Notice the steeper angle of the splines on the upper? Tell your dealer the factory gave you the wrong upper rack; ask them to send the spinner back in exchange for a new fixed upper. They should take this problem of your hands.